Many people decide they want to get fit and yet end up struggling with low levels of motivation. If you want to cultivate a toned, healthy body and maintain great results, the trick is to figure out how to feel good about your workout routines. Here are some tips that will help you design a fitness regime that promotes positive thinking. Firstly, you'll quickly end up feeling depressed and disillusioned if you set unrealistic goals. Before you decide on your aims, take a critical look at your current lifestyle, your fitness levels, the amount of free time you have each week, and your weight. If you are already pretty fit and just want to become more muscular or improve your endurance, it may well be realistic and helpful to set tough objectives. However, if you are carrying a lot of extra weight and have not tried to do any real exercise in years, you need to start out with goals that are much more modest. For example, don't promise yourself that you'll be many pounds lighter by the end of next week or that you'll be able to sign up for a grueling marathon by next month. Think about this: most people only use around .5 to 1 pound a week, and the average distance first time runners can make is .6 miles. Setting fairly challenging but undeniably sensible goals will keep you feeling motivated but also allow you to feel great about your accomplishments. If you are working with the Law of Attraction, it also helps to visualize these goals in visual detail once you have decided what you want to achieve. Here are a few more tips on How to Use The Law Of Attraction To Set Goals The Right Way. If you just repeat the same workout over and over, your body learns how to adapt to these activities and you start to burn fewer calories in spite of exercising for the same amount of time. In addition, repetitive workouts quickly become boring and uninspiring, leaving you feeling annoyed every time you realize you are supposed to go to the gym. It is smart to try interval training, alternating several minutes of intense exercise with a period of lower resistance exercise. It is also worth looking at local classes and find something that might be genuinely fun. Meanwhile, look out for adverts indicating team vacancies in sports that interest you, and don't be afraid to try new things. There are a couple of reasons why an exercise buddy can help to promote positive thinking when you are trying to boost your fitness. For one thing, your companion will turn workouts into a social activity, and you can combine your fitness “dates” with a relaxing hour at a coffee place or a chance to go shopping. 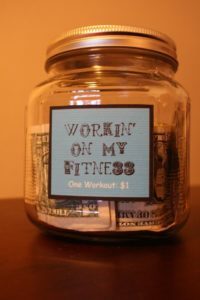 Consequently, you'll end up looking forward to workout days because they will be implicitly associated with friendship. Further, consider that having a gym buddy makes you more accountable when it comes to achieving goals. You can compare notes on what you want to achieve that week and then discuss whether (or to what extent) you met your objectives. You can also help to enhance each other's motivation, offering encouragement and positivity during an energy slump or a stressful week. Working on my fitness. 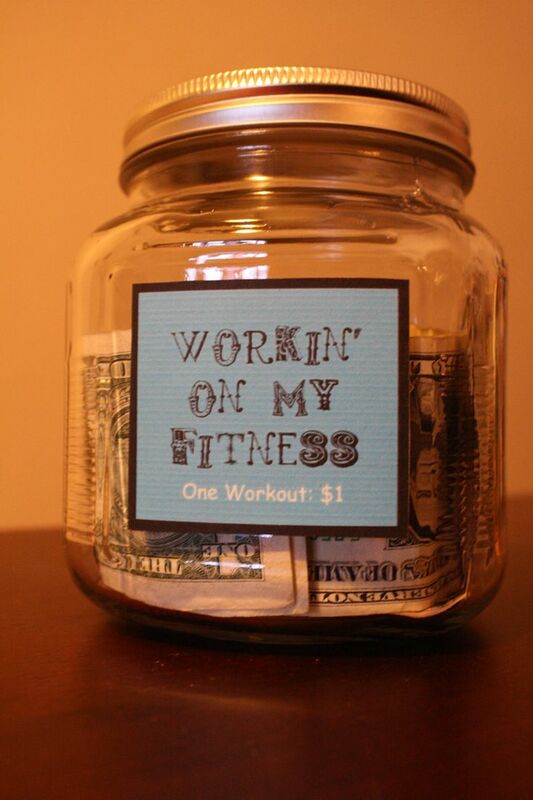 One workout = $1. As well as being held accountable for negative thinking or poor motivation, it is important to be rewarded for your various successes as you continue to stick to your fitness regime. You'll feel fantastic if you allow yourself to enjoy particular pleasures when you reach a milestone on your journey to better health, and you can be creative about the rewards you choose. For example, you might treat yourself to a gorgeous outfit that flatters your newly toned physique, or you could buy three new books to enjoy on lazy evenings. Anything that you love can be used as an incentive for continuing your fitness regime, provided the planned reward doesn't undermine your health! Avoid rewards such as ‘cheat' days as this encourages binge eating and unhealthy habits. There are certain common errors that can easily undermine your upbeat attitude towards exercise and leave you feeling like the entire venture is fruitless. Learning about these easy mistakes helps you to avoid them, promoting positive thinking as a result. Start by making sure that you are using gym equipment properly so that you do not end up hurting yourself in a way that tempts you to quit working out altogether. Thankfully, just one brief session with a personal trainer can help to make sure you are doing the right things to meet your goals. Next, do not rely on the scales as your only indication of increasing fitness levels. If you are training hard then you'll be gaining muscle while losing fat, but this will not be reflected on standard scales Make a habit of regularly recording your waist and hip measurements to see if you're losing fat. However, note that fitness experts stress that you cannot just choose to lose fat from specific areas (such as heavy thighs or a thick waist). Ignore the temptation of “spot training plans” and commit to the goal of losing weight from all over your body. You'll soon see fat vanishing from your least favorite areas as a result. Having a positive attitude towards exercise doesn't mean dedicating every waking minute of your life to pursuing a fitter body. It is easy to overtrain by accident when you are keen to shed excess weight and become more muscular, but working out too hard can make you feel so exhausted that your motivation disappears. You can also make your heart work too hard if you fail to drink enough water, leaving you feeling miserable after your session. If you begin by working out three times a week and ensuring that you are properly hydrated, you can gradually increase the frequency of your workouts as your fitness improves. Even then, however, you should take days off and deliberately prioritize activities that make you feel rejuvenated. Spend time with your favorite people, indulge in your most relaxing hobbies, and make time to reflect on all you have already achieved. Hypnosis can be a great way to change any limiting beliefs you might have about yourself and your weight. You can use hypnosis to reprogram your brain for a positive change. Self-hypnosis can help you to maintain a healthy lifestyle by introducing positive new habits and helping you to remove any beliefs that are holding you back. Click here to view the ‘Weight Loss' hypnosis track.